Does the concept of a Michelin-starred Thai restaurant seem contradictory? Australian David Thompson is the head chef at Nahm, a London eatery that was the first Thai restaurant to receive such an award. A few months ago, two of his disciples, Duangporn “Bo” Songvisava and Dylan “Lan” Jones (pictured right), launched what they hope will be “a world class Thai restaurant” here in the Big Mango. Tucked away in a small trok off Sukhumvit Soi 26, the somewhat eponymous Bo.Lan strives to stake out a place in the local culinary scene that I’m not sure really exists: a serious Thai restaurant where the emphasis is on the food in a deeply intellectual way. Why am I uncertain that this desired place even exists? Krungthep does not lack for “fine dining” Thai restaurants. The nicer hotels all have them (Erawan Tea Room at the Grand Hyatt is quite decent) and there are stand-alones such as Baan Khanitha that are popular destinations when guests are in town. But despite the attentive service and pretty decor, my perception is that, at its most basic, the food in these places is really no better than what I could get from the nighttime food vendors on Sukhumvit Soi 38. Some of these restaurants do focus on “palace cuisine” – fussier dishes that aren’t the mainstay of either typical Thai home cooking or street vendor’s woks – but the chefs at these fine dining restaurants still seem to be going through the paces, not really thinking about the food they are creating. If this desire to create an intellectual Thai dining experience sounds like a tall order, that’s because it is. Thais love eating but, if this makes any sense, Thais don’t spend a lot of time thinking about the food they eat. They don’t appreciate the origins or the presentation of their food as much as they are concerned that it is tasty. In the few months that it has been open, Bo.Lan has garnered lots of attention and is the place for well-heeled Thais to show their faces. One criticism I heard floating around was that the food was “too basic”. For this kind of money, it seemed that diners were expecting either the fussy palace cuisine or fusion food, in which western ingredients are placed into a shotgun marriage with Thai flavors, a recipe for disaster if ever there was one. Tawn and I decided we should reject all the things we’ve heard and go try BoLan. We enjoy thoughtful dining and wanted to think for ourselves about what Khun Duangporn and Khun Dylan were doing in their kitchen. The perfect occasion presented itself on Tawn’s birthday a few weeks ago. The restaurant itself is located in what looks like a modified former house. The ceilings are low and covered with traditional rice sorting baskets to help muffle the noise. The ambiance is dark but the volume from the background music (and incongruous mix of bland “world” music that include covers of 1980’s pop hits done in a bossa nova style) was a bit overwhelming. I arrived several minutes ahead of Tawn and it took some effort to get someone to take my drink order. When the bottle of wine I ordered arrived, it was incorrect and there was some confusion until another server explained that they were out of the the wine I had ordered. In order to get the best sense for the chefs’ skills, we went with the “Bo.Lan Balance” tasting menu which has, depending on how you count, about six courses but maybe as many as ten, depending. Because of the darkness, picture quality is low and I didn’t shoot pictures of all of the dishes as once they started arriving, our table was quickly overflowing with plates and bowls. 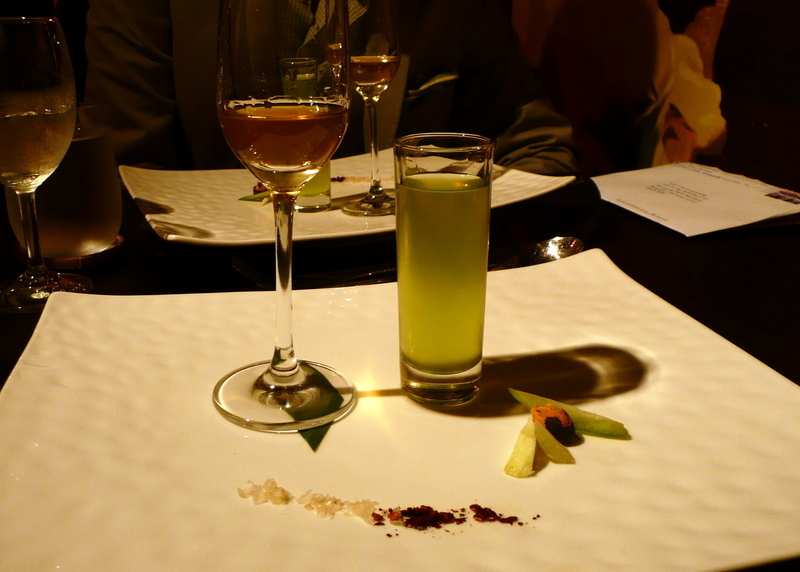 After ordering and before receiving the amuse bouche, a pre-dinner drink and snack was brought as part of the tasting menu. “Ya Dong Phaya Sue” is a tequila-like liquor, essentially a type of upcountry moonshine. 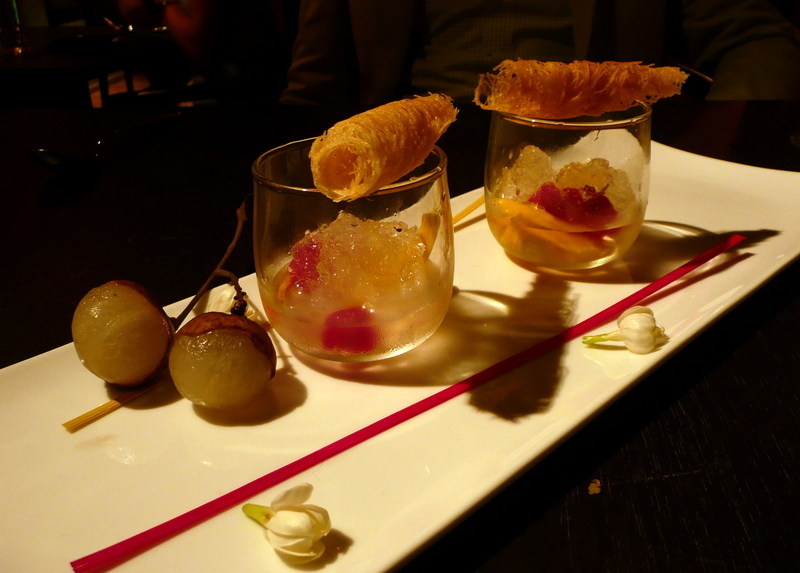 It was paired with an unsweetened pandan leaf juice shooter. When Thais drink, they like to snack on something salty, sour and spicy. A clever play on this were the slivers of green mango, another very bitter fruit called “ma dan” and a nut called “luuk yii”. These were dipped in the sea salt and chili flakes garnishing the plate. The process was like this: sip of liquor, sip of juice, bite of sour-salty-spicy snack, repeat. 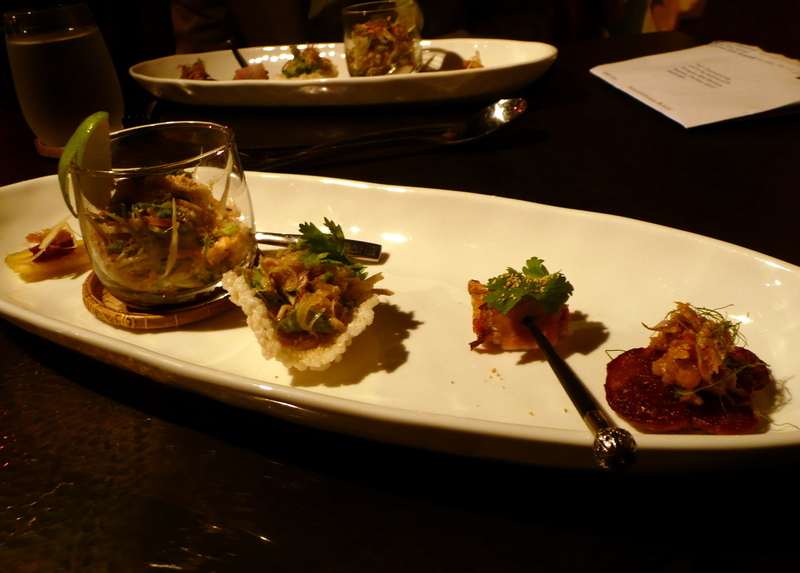 This was an interesting way to begin because it really was a deconstruction of the core flavors of Thai cuisine. It wasn’t a modernization or substitution, really. No messy fusion here. It was just taking each of the parts and laying them out individually. It was fun and adventurous. The amuse bouche arrived, five little bites to be eaten from left to right. The first was a slice of starfruit with tamarind and chili paste. Then a southern style rice salad called khao yam with rice, pomelo, kaffir lime skin, and toasted coconut with a fermented shrimp dressing called nam buu duu. Then a rice cracker with another type of salad on top. Then a slice of grilled pork neck with coriander leaf and toasted, ground rice. Then a small seared rice flour pancake – pang ji plaeng – topped with shrimp and fried garlic. Again, the core flavors of Thai cuisine were each represented but as you progressed through the plate, the emphasis changed. The first bite was very sour with a bit of spice. The second was very salty/fermented. The third was spicy. The fourth was salty. The final one was a little sweet. Especially interesting was the second dish, the southern style salad. The sauce is very complex and it is a rarity in Thai restaurants. Tawn recalls his grandmother especially enjoying it. The next five dishes arrived all at once, served in typical Thai family style. This was a lot of food and while they covered all their bases – one salad, one soup, one curry, one stir-fry, etc – it gave us too much food for two people. The first dish, pictured above, was preserved duck egg simmered in fresh coconut cream with lemongrass, white turmeric and chili, served with pickled turnip omelets and fresh vegetables. It was very tasty and had clean, pronounced flavors. 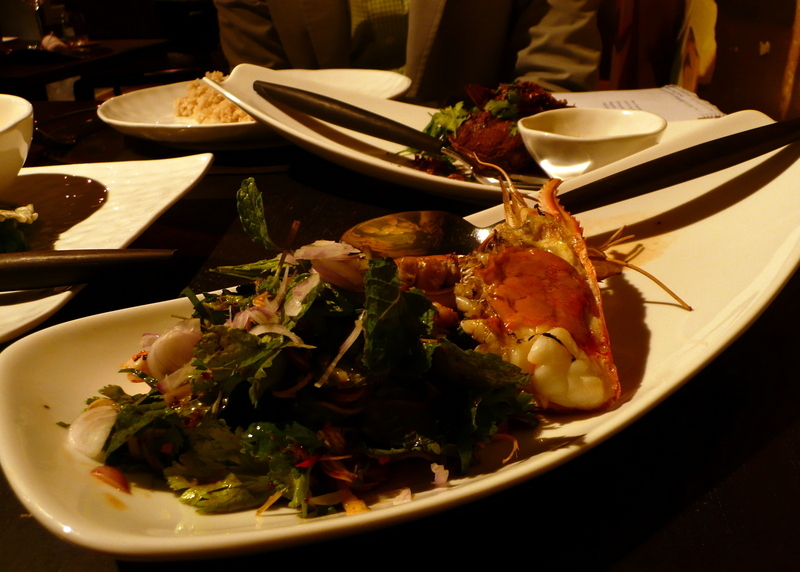 There was also a salad of grilled river prawn with lemongrass, mint, coriander and chili jam dressing. The dressing was a bit heavy. The river prawn was very fresh, though, and the spice of the dressing did cut through the richness of the prawn meat very effectively. Other dishes we received included a deep fried “blue fish” marinated in turmeric, garlic and shallots served with a southern style lime and chili dipping sauce. The fish was a small portion and was very bony. While the taste was good, the skin was rubbery instead of crispy, an unpleasing texture. Between the fish and the prawn, I think we would have been fine with just the prawn. We also received a gaeng khiaw wan nuea kem – green curry of salted beef ribs. Tawn isn’t a beef eater but did try this curry. At first, it tasted a bit… not rich, because unlike most versions of this curry, it wasn’t finished with a lot of coconut cream. But the more I tasted it, the more it grew on me. It was like having a consomme, the beef broth’s flavors remaining very distinct, but with the added layers of flavor and complexity of the homemade curry paste. The salted beef ribs added a nice note to the dish and for the first time in my life, I fully appreciated why the little baby eggplant are in this dish. Their crunchy sourness paired very nicely with the saltiness of the beef and the fragrant aroma of the curry. Each of us ordered a small soup. Tawn had gaeng juut, a so-called “bland” soup with baby squid stuffed with pork in a clear broth. In this case, the broth was very herbal and a little sweet and it wasn’t anywhere near bland. I ordered a spicy pork soup that had large, leafy vegetables that were tangy. It was flavorful but at this point I was getting so full that it stopped being enjoyable. The meal was served with jasmine rice or “gaba” rice, a darker whole grain rice. In a rather stingy measure, despite having spent 1500 baht (US$ 44) per person on the set meal, they ding you an extra 30 baht if you order the gaba rice. The main dishes were well prepared but some of the “intellectualism” of the amuse bouche and pre-dinner drink were missing. Certainly, the quality of ingredients and attention to detail during preparation were very high. 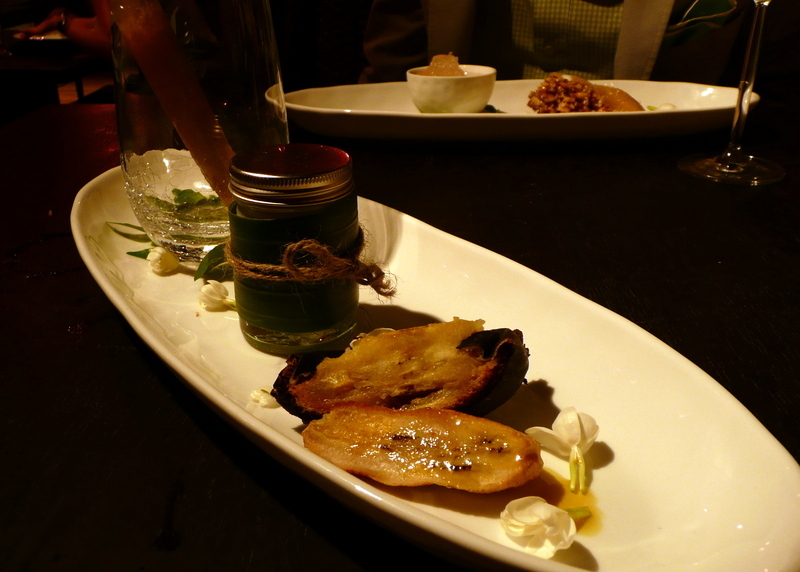 The preserved duck egg and the green curry were the best of the dishes. The work that went into making the curries from scratch really paid off as the flavor profiles were very distinct. In fact, two weeks after eating them, I can still recall their taste memories. The prawn and fish dishes were both a little flat. They weren’t bad, but they also weren’t spectacular. The soups were lost in the shuffle. Too many flavors competing for attention on the table and, because of that, I think the menu could use some paring down. Service throughout the meal was inconsistent. They tried to educate us about what we were eating, explaining the dishes before us. Tawn’s observation, which I agree with, is that they didn’t seem to really comprehend what they were telling us, instead repeating the instructions they had been told to give. It was difficult to believe that these servers are really passionate about the food they are serving. As Tawn put it (as I write this) they probably eat the local vendor’s som tam – green papaya salad – with one single note (spicy!) when they’re on their meal break. Oddly, in a country where desserts aren’t a major part of the dining experience, there were three separate dessert courses as part of the set. 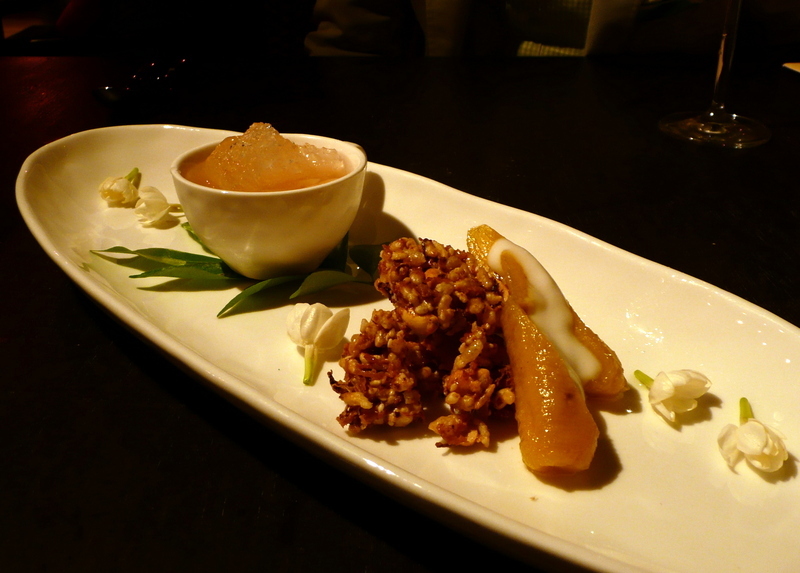 The first was another deconstruction of a popular dish: tabtim grob – dyed “ruby” water chestnuts that are coated with flour then fried, coconut agar agar and jackfruit served over crushed ice with syrup. This was refreshing and the presentation was fun. Had it been left at this, dessert would have been a satisfying end to the meal. The “dessert du jour” (different for both of us) started to venture into the overwhelming. There was a plantain that had been grilled in its peel and then drizzled with a perfumed sauce, a play on the grilled plantains that are a popular street vendor snack. This one was starchy in an unappetizing way and a single bite was more than enough. The jar contained saku – tapioca pearls with coconut cream. This is a favorite of mine, but there was nothing about the preparation that was outstanding. The saku I buy at Villa market is every bit as tasty, and I became preoccupied by the fact that the mouth of the jar was barely wide enough for my spoon. Finally, not fully visible in the glass, is a popsicle frozen on a chopstick. I think this was meant to be tamarind flavor, but after one bite I found myself not very interested in it, either. Tawn’s dessert was gluay kai chuam grayasat – this is an intellectual play on a Thai snack, small sweet bananas that are eaten very ripe with rice crackers. Here, they took the bananas and boiled them in a sugar syrup. The rice crackers were a homemade meusli-like mix of fried rice, nuts and toasted coconut drizzled with palm sugar. This was tasty and kind of fun. In the bowl was graton loy gaew – a tropical fruit that is sour and tough on the outside but cottony and sweet on the inside. The fruit was also soaked in syrup and then served over ice. The elements of the dessert really played off the “balance” theme of the set menu: crunchy and soft, sour and sweet, tough and cottony. While they may believe that nothing succeeds like excess, the petit fours accompanying our post-dinner tea were too much. 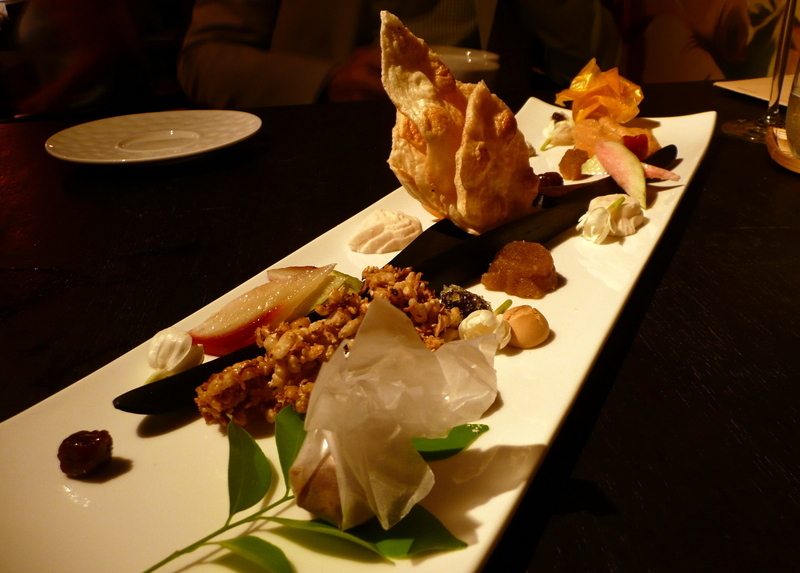 They were a scattering of Thai dry desserts, some fruit, and khanom goh – a type of meringue. By this point we were so satiated that we hardly touched the petit fours, calling instead for the check. Conclusions. For 1500 baht per person, we received a very generous amount (too much, really) of well-prepared, very high-quality food. I would like to go back and order a la carte, trying some other dishes and maybe choosing a bit less food for my meal. There is no doubt that the chefs are giving their creations a lot more thought than most Bangkok chefs, Thai or otherwise, are. That’s refreshing and, most of all, interesting. The challenges Bo and Lan face are twofold: the first has to do with their staff. If you want to cultivate customers who are passionate about food, you have to have a staff that shares and can spread that passion. I did not feel it. The second is that they have a long uphill slog to find diners who are true foodies. I’m not convinced that breed of diner is very plentiful here. As a chef of the short-lived but very enjoyable Paradox restaurant on Ekkamai explained, Thais who have the means to travel overseas mostly like to stick with group tours and Thai or Chinese food. Expats who have the means to eat well in Bangkok are on expense accounts and go for imported steak, Japanese food, or Italian. As a foodie, I hope they are successful. 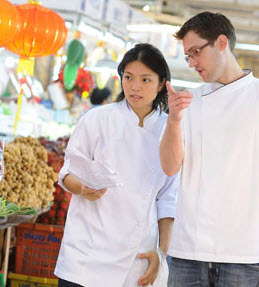 Something I noticed on their website is a page that is supposed to link to the Bangkok chapter of Slow Food International. Tellingly, the link doesn’t work. That may say more than anything else about what Bo.Lan’s chances are. 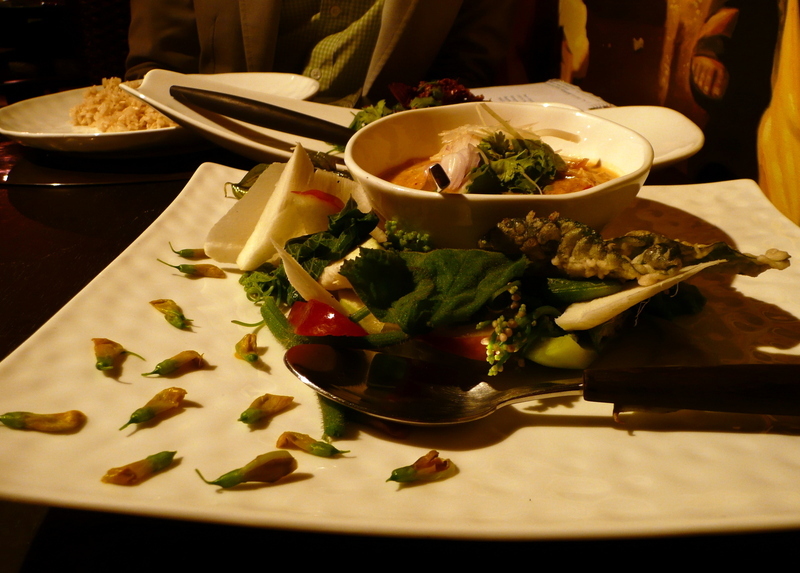 This entry was posted in Uncategorized and tagged Bolan, Dining, food, Thailand by christao408. Bookmark the permalink. That was an incredible amount of food! I was stuffed just reading about it. Wait staff is very important, even in a chain restaurant. Thought the photos were delicious. A nice review of what sounds like an interesting place. Sounds like way too much food, though, and maybe a bite or two of each thing would have been enough! Wow! That is sooo much food! So of the dishes look like they’d be very interesting to taste. Tawn’s dessert looks quite good! What an excellent review of the food and the place! Very well written. Too much food though. So how many pounds do you guys gain when you eat out like this? @ZSA_MD – Thankfully, Thai food isn’t particularly calorically heavy, so we didn’t gain much. Plus, once we reach full, we only take a small bite or two of subsequent dishes. gosh THB1500/person? it sooo ch….I shd say It’s such a good deal, the presentation of the food is quite nice…and of course your review is well written…Thanks for sharing..
That’s a lot.Maybe one of the chefs has a dessert background?? ?Yuck to the fish texture but kudos to their vision though! @murisopsis – Thanks, the photos turned out better than I expected. Thank goodness for my mini tripod. @CurryPuffy – Well, next time you’re over here we’ll take you there. @agmhkg – Yeah, the price really isn’t bad in absolute terms, although it is a bit pricey for Bangkok. @yang1815 – I don’t know about the dessert background although their bios don’t say anything about a particular pastry emphasis. 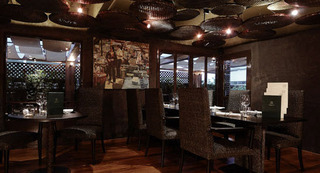 @TheCheshireGrins – The taste was really spectacular, especially on a few dishses like the curries. @slmret – Glad you enjoyed the review.